Recently I made a variety of cupcakes for Joe to share at work. One of the choices was this citrusy lemon cupcake which was my personal favorite. 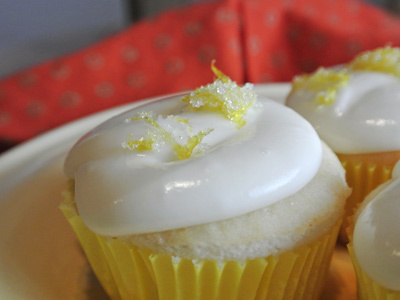 I just love the fresh citrus of lemon that shines through this tiny cake. The cupcake was very moist and the lemon cream cheese frosting tasted like a smooth lemon cream. I mixed a little sugar and lemon zest together to make a pretty crystallized topping. I found this recipe on a beautiful blog post by “My Baking Addiction” but scaled it down to make an even dozen cupcakes. 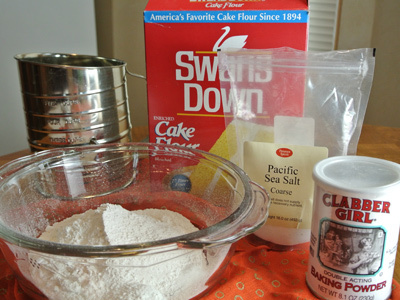 Starting with the cake dry ingredients, you’ll need some cake flour, salt and baking powder. And for the wet ingredients, some buttermilk and egg whites plus vanilla extract which I forgot to include in this picture. 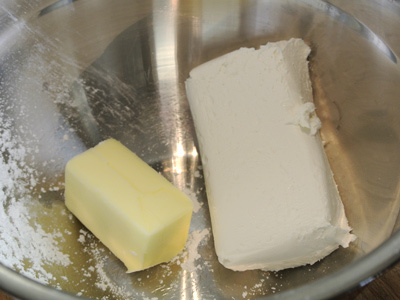 To begin, place a half stick of butter (at room temperature) in a mixing bowl along with the sugar and lemon zest. 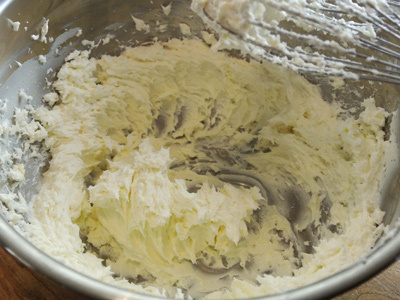 Using a hand or stand mixer, beat the butter and sugar mix until they are light and fluffy. 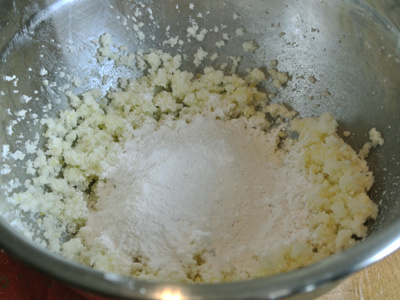 Begin adding about a third of the dry ingredients and mix well. Next, about a third of the wet ingredients. 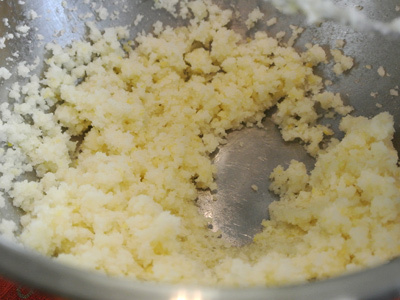 Continue mixing alternating the dry and wet ingredients until they are all combined. 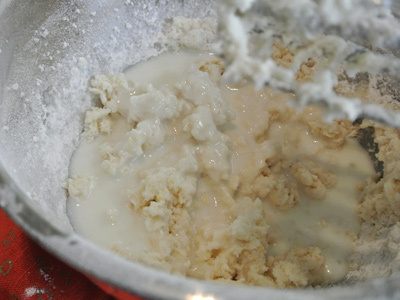 Continue mixing until the batter is well incorporated. Begin filling the baking cups about 3/4 of the way. Place in a 350 degree oven and bake 18 – 20 minutes or until toothpick tested. Set them on a cooling rack to cool. You will want them to be completely cool before frosting them. While the cupcakes are cooling it’s time to make the frosting. 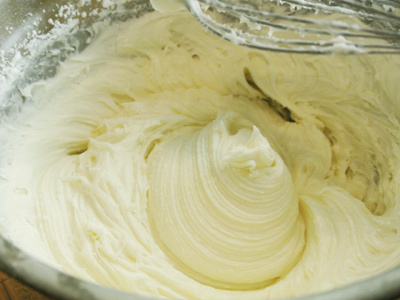 Combine your butter and cream cheese in a mixing bowl using the whisk attachment, whisk them together until well combined. Add about a teaspoon of vanilla extract. I just eyeballed it. 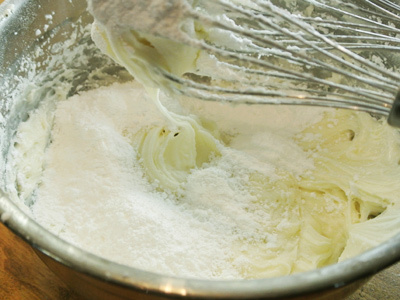 Whisk in the vanilla and begin adding the powdered sugar a little at a time. Whisk after each addition. The frosting will become smoother with each addition. Now that it’s all mixed together, time to add the juice of 1/2 lemon. This does thin the frosting a bit but it will hold on your cupcake. If you want a thicker frosting, add a 1/2 cup additional powdered sugar and mix well. I filled a snack size zip lock bag with frosting and cut the corner of the bag. 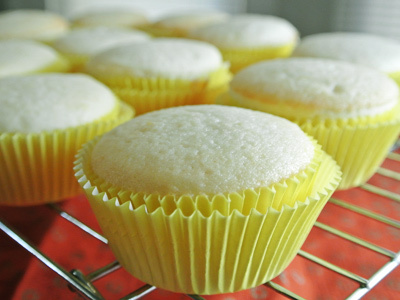 Squeeze in a circular motion over the cupcake to pipe the frosting. 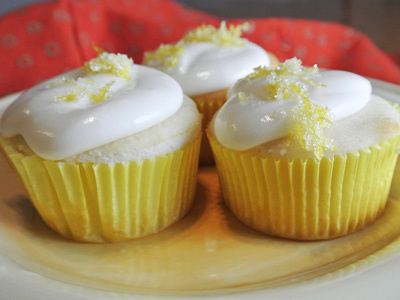 If you’d like to add some crystallized lemon zest, add the zest of 1 lemon with 1- 1 1/2 tablespoons sugar. Mix together and let sit for a few minutes before sprinkling over top. 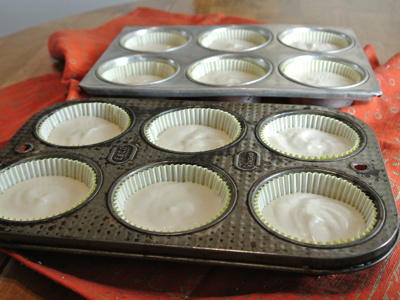 Prepare muffin pans with paper liners for 12 muffins. Sift together the flour, baking powder and salt. 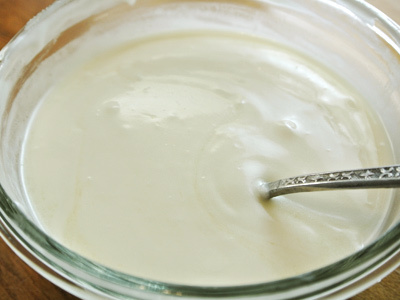 Whisk together the milk, egg whites and vanilla extract. 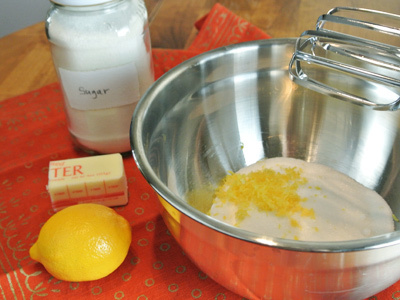 In a medium mixing bowl of a hand or stand mixer begin creaming together the sugar, lemon zest and butter until it becomes light and fluffy. Add a third of the dry ingredients while beating on medium speed. Add about a third of the wet ingredients and beat in well. 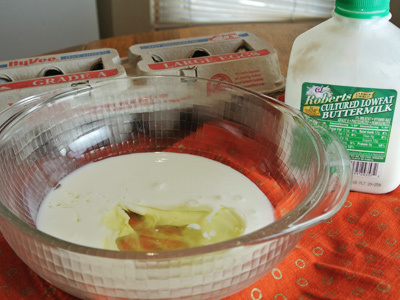 Continue alternating between the dry and wet ingredients until you have incorporated the batter into a smooth mixture. 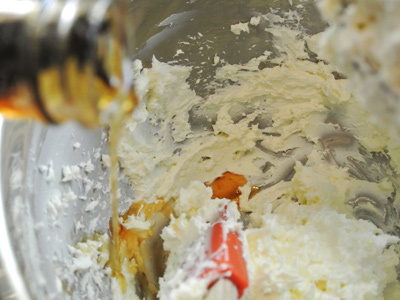 Blend the butter and cream cheese together using a hand or stand mixer using the whisk attachment. Blend together until well combined. Gradually add the powdered sugar a cup at a time, mixing well after each addition. Blend in the vanilla and lemon juice. Place frosting in a snack size zip lock bag and cut the tip of one corner to pipe frosting over cupcakes. **To make a crystallized lemon topping, add the zest of 1 lemon and 1 tablespoon sugar together in a bowl. Blend well and lightly sprinkle over top of frosting. sounds lovely! and the frosting looks awesome! These sound wonderful. I love most things made with lemon. Oh me too! Thanks for stopping by! These are so adorable, Jan! 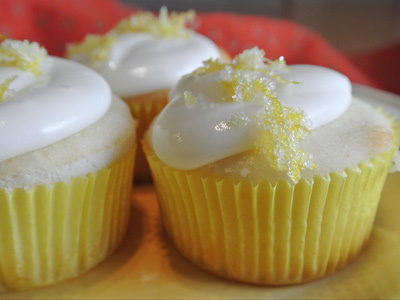 I love the crystallized lemon topping, it’s a lovely touch and really completes this cupcake. Thank you Anne, these cupcakes were truly a joy to make! these were awesome, very lemony! Carrot cake one was yummy too. All were a big hit at work!